As a crafter, I like to make most of my own home decor pieces. I regularly check out the dollar bins and local stores for things that I can alter. I love when I score a great bargain that I can turn into something special. 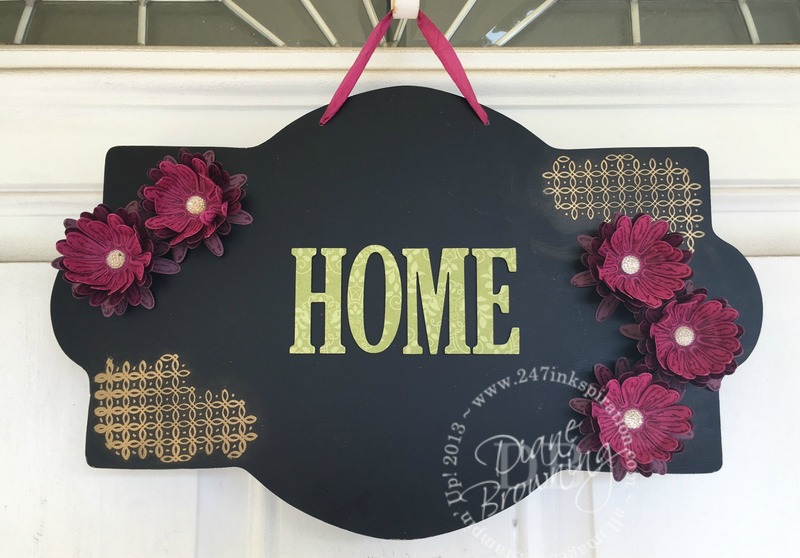 Today’s project is a fabulous “Home” sign that I made from a plain $3 chalkboard sign. This chalkboard sign started out completely blank and it had a plain black ribbon. I was fairly certain I could heat emboss the chalkboard and not damage it. I did a test patch on the back side just to be sure before committing to the front side. And it worked perfectly. I stamped the gold lattice work on the bottom left and upper right in Versamark ink and then used Gold embossing powder. Then I heat set the embossing powder. I also swapped out the store’s black ribbon for one of Stampin Up’s ribbon in Berry Burst. I think changing the ribbon really makes a difference in the sign. Our ribbons are so very nice and the one from the store was starting to fray. 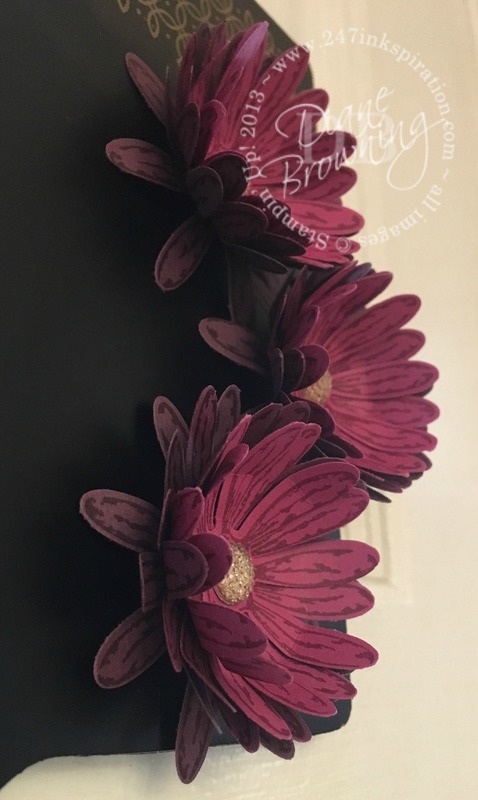 I used the Daisy Delight stamp set and coordinating punch to make the flowers. I realize the punch has had some availability issues since the start of the new Catalog. It was sold out for the longest time, then back in stock, and now it’s sold out again. This punch has been more popular than any other punch in the last couple years. I think they said it’s sold three times more than any other punch last year in just the few months it’s been available this year. Wow! The great thing about the daisy stamp and punch is that you can stamp both sides of the punched flower. To do this, start by stamping the first side, punch, flip it over, and stamp again. Yes, it really works. The flowers are made up of two layers each of Berry Burst, Rich Razzleberry, and Fresh Fig. Here’s a close up view of the flowers. If you look closely, you can see that both the front and back sides of the petals are stamped. This is a great touch when you are making a 3D project. It brings some realism to your project. You should give this a try on your next project using the Daisy Delight stamp set and punch. 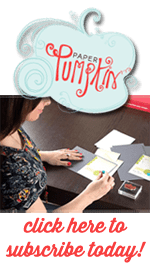 For the month of July, Stampin Up is offering two incredible specials: Bonus Days and Christmas In July. Don’t worry, you can take advantage of both of these awesome deals! Has your wish list grown since the new catalog came out? Then treat yourself to Bonus Days: for every $50 you spend July 1–31 (before shipping and tax), you’ll get a $5 Bonus Days coupon that you can use August 1–31. There is no limit to how many coupons you can earn. Spend $100, get two coupons. Spend $150, get three coupons and Host Benefits too! Ho, ho, ho! Our Christmas in July promotion makes it easier than ever to sign up to be a demonstrator! Just purchase your Starter Kit by July 31 and you will receive a FREE Essentials Gift Pack including Paper Snips, SNAIL Adhesive, Grid Paper, two D Blocks, and a Bone Folder. That’s an added value of $52! And since as a new demonstrator you can get your hands on new products before anyone else, we will include the Carols of Christmas Stamp Set from the holiday catalog for FREE ($20 Value)! The Starter Kit costs $99 (including shipping), and with this promo, you will get a total of $197 in products for only $99. This deal is too good to pass up. Sign up now and join my team.